NEW! Custom Seal Configurator. Click here to try it now. 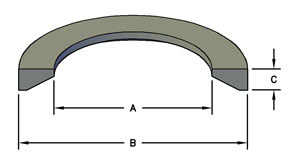 DIN 3869 profile rings are axialy static soft seals in combination with threaded elements. They are molded from elastomers used for sealing threaded tube connections and fittings. Most common application, construction machinery, hydraulic presses, injection machines, etc. The DIN3869 is offered in two materials, an NBR 85 Shore A (black finish), and FKM 80 Shore A (green finish). 5910 Henri Bourassa Blvd. W.